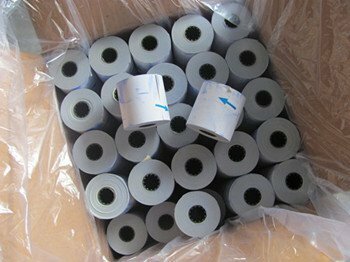 Self carbonized paper roll, also known as self contained paper roll, is produced from carbonless paper. 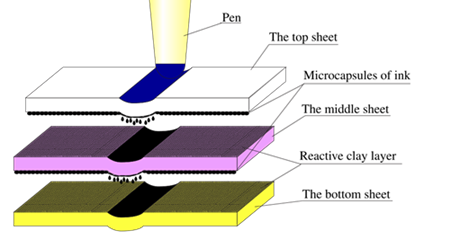 The carbonless paper consist a variety of coating technologies that enable it to be best used in devices that produce receipts that can be printed on. Their ease of use and safety track record has made them very popular for use around the world. They are cleaner and less messier to use compared to carbon paper and have a longer shelf life provide conditions are ideal. When pressure is applied to it,there are dyes that are released and combine to create the desired image. The entire process was invented in 1952 by two chemists called Barry Green and Lowell Schleicher. The chemists wanted to create paper that was quite biodegradable and it would not cause stains like carbon paper. The first Self carbonized paper rolls consisted of a dye known as crystal violet lactone in conjunction with the chemical PTSMH, trimellitic anhydride, formaldehyde isocyanates, diisopropyl naphthalenes, phenol-formaldehyde resins, polycyclic aromatic hydrocarbons, epoxy resins, Bisphenol A, aliphatic isocyanates and hydrocarbon-based solvents. All these dyes and chemicals could be incorporated to a one ply, two ply and three ply sheet. The three ply sheet for example would be coated back for the top sheet for the middle sheet it would be coated front and back and the bottom sheet would be coated front. Manufacturers of paper rolls could use numerous middle sheets depending on the number of copies that the client intended to produce for the receipts or invoices. Standard NRC paper rolls can produce 6 copies if the printer is dot matrix, five copies if it is going to be hand written and seven copies if it’s for a type writer. The paper roll can either be one ply, two ply or three ply and comes in sizes of 57mm x 57mm, 57mm x 70mm, 75mm x 70mm, etc. The Self Carbonized Paper Rolls have a guaranteed shelf life of two years but they could last longer depending on how they are stored. Factors such as the sun, humidity and plasticizers greatly contribute to how long the papers are going to last. It is recommended that the paper rolls be stored in a room with temperature below 77-78F and the relative humidity levels should be below 45% .The paper would not fade for at least fifteen to twenty five years if kept in the manufacturer prescribed condition. It is usually businesses stationary that would require multiple copies. Some of these examples are receipts and invoices. The original copy would be given to the customer which would be white in color, blue, yellow, green or pink for the copies that would be used for other business purposes. More and more companies are moving from carbon paper to Self-contained paper. The Self-contained paper has become quite accessible and is also affordable due to its popularity, many businesses around the world use it as its preferred method of print production.